Like many people, I am not the best at remembering to hashtag my work online, but I do have a few hashtags that I have stuck with and which have provided very useful. The #LatinLOLcat is one I have been using for my Latin LOLCat project, for example, #GrammarCatz for my GrammarCatz. I use these hashtags when I post at Google+ about new items in these projects, and now that I am back on Twitter, of course I use the hashtags at Twitter too. Just recently, I started using a new one: #foreignwordsinenglish - along with the related hashtags #sanskritwordsinenglish #arabicwordsinenglish and so on. I'm pretty excited about it - I'm going to be posting one every day at Google+ and then also at Twitter. Just like with my other projects, the basic foundation for this new project is a blog, and the hashtag corresponds to the label I am using in the blog: Foreign Words in English. I still don't have a lot of discipline in using hashtags when I post at Google+ and Twitter, but using labels religiously at my blogs has been a big help in getting me more used to the idea of using hashtags when I post. This little experiment is something I started as a result of reviving my Twitter account - hashtags reign supreme at Twitter, far more so than at Google+. Here's an embedded Google+ post with today's word - and you can follow the #foreignwordsinenglish tag at Twitter. Maybe others will start using #foreignwordsinenglish also (how cool that would be!)... but even if not, it works for me, and as I accumulate a big supply of these, the hashtag will let people read past ones in addition to the new one I post each day, and I can link to the Twitter hashtag stream so people can see that the project really is ongoing, with a new word every day! One of my favorite tools for the past few years has been the OU Chatter, which Eddie Huebsch (OU IT) has set up and maintained for all OU users. The Chatter had more users in the past, and I hope it will see more users again. It's a great way to have discussions, private to people who are part of the ou.edu domain. I use the browser-based version, although I know other people use the desktop and mobile apps. I make sure to check it several times a day, and I try to post something new there every day. Just think how cool that would be if everyone were using it! Admittedly, I wish everyone would use Google+ and Twitter, so that we would not be keeping things private just to OU. 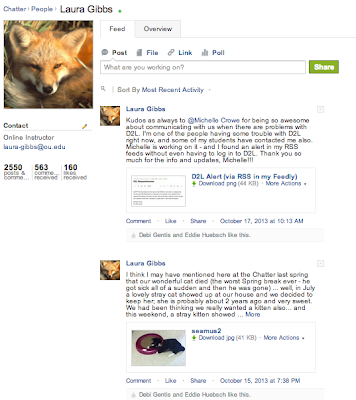 But for people who want a discussion that is limited to members of the OU community, Chatter is a great solution. Anyone with an ou.edu address can create an account; for more information, contact Eddie Huebsch or me (laura-gibbs@ou.edu), and I'll be glad to send you an invite and answer any questions you might have. I find lists to be incredibly useful at Twitter! The main reason I have started using Twitter again is to be more connected with the social networking scene (such as it is) at my school, and I was delighted to find lots of University of Oklahoma faculty and staff who are indeed using Twitter, some of them very actively. I don't follow all of these people, but whenever I find an OU faculty or staff member at Twitter, I add them to this list, and I make sure to check it periodically every day. It is a source for many of my retweets, and I have made some personal connections this way, too. Below is a list of the latest tweets from the OU People Twitter List. If you have a Twitter account to add to the OU People List, let me know! Here I am at Twitter: OnlineCrsLady. I also keep a list of OU Programs.